In Poland, April is not historically “neutral”, a lot of anniversaries are celebrated on local or national scale. The biggest event and its anniversary is the Warsaw Ghetto Uprising – dołączyć żonkile. Some information about it is present in media a bit earlier as well (in the news or parts of programming dedicated to discussion or debate). and 2 political commemorations – such as the anniversary of the Smoleńsk tragedy of 2010 (April 10), and the International March of the Living (“Marsz Żywych”) on April 12 (which is both, historical and political occasion). Political, because the misunderstanding of the new law introduced in Poland, penalizing the propaganda writing of “Polish concentration camps” get media attention in previous months. In public television (in different channels) during the whole week the social campaign spot was broadcast, spot on the German concentration camps. It was produced as the answer to anti-Polish propaganda. Propaganda in which some lies about death camps were used to change the understanding the Holocaust history. From television channels only two were chosen – TVP1, which is official public media channel with the largest free range. Another channel, TVP Historia is dedicated to the history as such, however, nature and entertainment is also present here. It is necessary to stress that in April 2018 TVP1 was not the leader on TV market in Poland, was located on the 3rd position after two commercial stations, Polsat and TVN. Any of programming discussed in this report did not gather significant audience to compete with entertainment offered by commercial and public TV channels. Analysis of content of TVP Historia programming is available in the tables, where positions are shortly described. However, some positions in programming, not included in the analysis are worth mentioning. On the TVP Hisotria channel during the mentioned week in the days April 9-13, two times daily was broadcast a kind of tevelogue Wojciech Cejrowski – boso przez świat, in which the host visits a given country and presents life of inhabitants, some information about the history of region, etc. However, the host is controversial, presents his own vision of the events even when he uses archival movies and photographs. Sarcasm and provocation is the basic style of host, when referring to history – he treats it as entertainment. Ant the programming is treated as entertainment, and at the beginning of production was rather popular. Nowadays – it is broadcast as a series of repetitions. It is necessary to mention this programming because history is “smuggled” into it and interpret in very strange way. The internet echoes some programming and the links are mentioned in the article and in the tables. A lot of parts of program one can find on the VoD platform, however – there are a lot of commercials before the movies and in the middle, and they are in Polish, English subtitles are rare, so for international viewers watching can be difficult. In the report the discussion on the television content (when comments are allowed) is also included, and the debate on the historical topics important during the whole week. Twitter, YouTube, and some groups on Facebook are analyzed in order to find typical narrative patterns, and users’ attitudes. According to the research conducted in April 2018 the most influential Polish medium was channel TVN, materials presented in this channel were the most frequently quoted in other media (2 540 times). Fifth position in the general statics occupied portal Wirtulana Polska (wp.pl), with 1 621 quotes in the other media. Historical topics mentioned at the beginning of this report were not so important as actual, political information. TVP1 programming on history was focused on different topics such as the beginning of Polish history during Medieval times (one episode of “Korona królów”, The Crown of Kings), cultural heritage connected with life of Nicolaus Copernicus or the newest political history in 3 different documentaries. Some positions in programming remind about the Smoleńsk tragedy (which is the next day celebration), using the biographies of politicians. The biographical character of all documentaries is significant for all positions (even the theatrical performance – see the table 1). The whole historical programming took close to 5 hours of official 24h programming during Monday. TV series “Korona królów” (The Crown of Kings) was broadcast two times daily during the weekdays, it is 2018 production of official media. This series was criticized by the style of production (pompous), bad acting etc., however, the public was of different opinion – the series is popular, and according to statistics – 91% of internet users who filled the questionnaire liked the production, and average viewership was estimated for 2,05 mln. In the comments available on YouTube under some clips announced the series people talk about actors, their attachment to some heroes etc. Some internet users share their visons of Polish kings and their achievements. A documentary “Prawda znalazła swój dom”, Truth found her home, was broadcast close in time to the commemoration day of victims of the Katyń massacre (April 13). The topic was present also in the other channels during the whole week, especially during the news journalists mentioned some planned celebrations, discussed the cultural context of this year anniversary, visited with cameras the cemeteries, or monuments and memorials etc. Table 1. TVP1 programming referring to history, April 9, 2018. The most popular “epoch” presented during the programming of TVP Historia was WW2. A lot of context were discussed, military history, battles, political speculations, Eastern front problems etc. One position is worth mentioning, a documentary “Powstrzymać Holocaust”, Hidden Stories – The Holocaust, the topic is connected to the close in time anniversary of Warsaw Ghetto Uprising (April 19), and the International March of the Living (April 12). The documentary was repeated in the programming. In TVP Historia channel on April 9 one episode of the nature documentary, “Olbrzymy z epoki lodowcowej”, [Ice Age Giants, dir. Mark Flowers, 2013] was devoted to life in caves during the ice Age. Documentary on the prehistoric era covers also the life of cavemen. It is not included in the table because the main accent is put on animals not on humans. During the whole week some cases like this appeared on TV, but it is hard to calculate the percentage of time dedicated to history as such. In the programming of TVP Historia TV series Victoria is included because the characters and events are real, some historical problems are explained as well. This TV series presents the panorama of 19th century customs, social and cultural issues in the Western history. During the whole week April 9-15, 2018, TVP Historia broadcast “Było nie minęło… Kronika zwiadowców historii” (Past is still alive – Chronicles of scouts of history), the new episodes of program which is still very popular after revival. The authors are very active also on Facebook, “Było nie minęło…” gathered 17 351 followers. The program has status of “cult” among keen viewers. Some episodes are available also on the VoD platform. In the programming searching for historical artifacts is shown, sometimes viewers observe the struggle with bad conditions of potential archeological sites. In a lot of cases – the artifacts are collected by private owners, however, in this year new law will be introduced to control these spontaneous, amateur archeology. The hosts sometimes show how amateur archeologists destroy the forest or some fields in their “gold rush” connected with artifacts from WW2 or older military sites, battlefields etc. The discussion on this forum, and similar internet sites revolved around the findings, collections and ownership; a lot of angry comments were connected to the official searchers, like museums or not precise pointed “national” institutions. However, the programming as such is very good evaluated, fans supported efforts of “Było nie minęło…” creators by good reviews of the reportages on YouTube and the other sites. Figures 2 and 3. 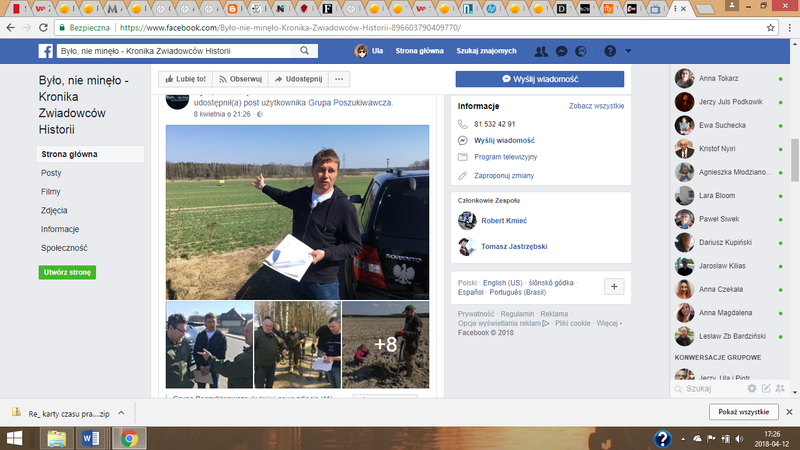 Print screens of Facebook site of Było nie minęło… Kronika zwiadowców historii, / Past is still alive – Chronicles of scouts of history with posts announcing the newest episode broadcast on April 10, 2018. In the public media during this day 8th anniversary of the Smoleńsk tragedy was celebrated, a lot of news and information programming commemorate the victims, documentaries dedicated the tragedy were also broadcast. In TVP1 only one part of programming on the historical background was broadcast – the TV series “Korona królów” (Crown of the Kings), one repeated episode and one new (50 minutes in total). TVP Historia daily programming is present below in the table. Jak było? How was it? Almost all positions during April 9, 2018 in TVP Historia were connected to the WW2 era. 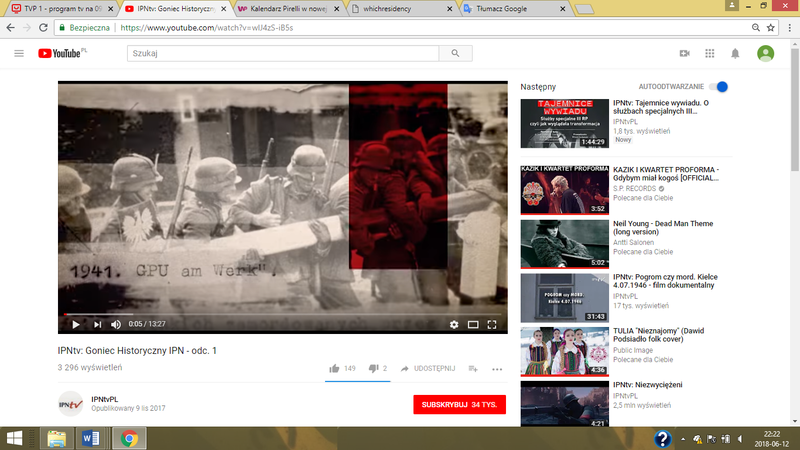 Military and political history of WW2 was the topic of documentaries, or was the background to the TV series “Pogranicze w ogniu” (Boarderland in fire), advertised as “hit of the day”. Even the action of the movie dedicated to one of the accursed soldiers, “Historia Roja” (Story of Rój), starts in 1945. This movie belongs to two positions which are worth mentioning from the whole offer together with the new in 2018 TVP Historia offer series of discussions support by documentary materials “Jak było?” How was it?. The series was introduced in March, the host, Przemysław Babiarz works under motto by Józef Mackiewicz, “Only truth is interesting”. The formula is simple – studio discussion, invited experts represent scientific institutes, culture centers, museums, etc. ; before the debate is short documentary introduction. Archival movies and photos are also presented during the program. In the episode present this day, the historical context of the uprising in the Warsaw ghetto was the main topic (as I wrote before, the Uprising begun at April 19, so – this programming is a part of celebration the memory of this event). According to Google trends statistics, the interest of this Uprising in one year perspective reached its’ peak on April 15, 2018. It means that people tried to find information before the celebration. Some historical services devoted to this dramatic event are available in English, as prepared by POLIN, Museum of the History of Polish Jews in Warsaw. Figure 4. Montage of print screens from the documentary part of “Jak było?” How was it? Figure 5. Frozen frame from “Historia Roja” (Story of Rój). “Historia Roja” (Story of Rój) is the movie produced to commemorate life and effort of some accursed soldiers. Two years ago on YouTube the official channel of the movie was opened: https://www.youtube.com/channel/UCiFcFJj9RSo8NtF_bilj0BA. the channel is not so popular, has only 608 subscribers, watching statistics is not so impressive – from 3000 to 6 500 screenings per movie clip. What is worth mentioning, among clips referring to states of production, parts of the movie, there is a report from press conference during which the family of hero (real life person) portrayed in the movie talked about trolling and wave of hate against the movie, Rój (Mieczysław Dziemieszkiewicz), and against accursed soldiers. And hatred is present even this year in some comments on the fora connected to some movie reviews and articles about it. A lot of very critical, and sometimes even mean or „poisonous” are present still in the net; some of these reviews criticized not the movie but nowadays political reality in Poland, the government and ruling party cultural preferences, etc. On the basis of Historia Roja the TV series was produced and it can be watched on the VOD platform: https://vod.tvp.pl/website/historia-roja,29255309. In TVP1 during April 11, only 4 positions were dedicated to historical programming, all were feature TV series, two positions were on WW2, one episode of “Wojenne dziewczyny” (War girls, 17), and one of “Tajemnica twierdzy szyfrów” (The Secret of Code Fortress, 11, TV series of 2007). Two episodes of “Korona królów” (The Crown of Kings) were broadcast, (60 and 61). It means that only 2 hours and 16 minutes of 24 hours programming was devoted to history, in the feature productions, and more time from was dedicated to the WW2 everyday life and fight for freedom. Figure 6. A print screen of the Telemazyn information on Tajemnica twierdzy szyfrów” (The Secret of Code Fortress. During April 11, in TVP Historia a lot of historical epochs were represented in the programming – Ancient Greece, Medieval times and crusades, WW1 and interbellum, the newest Polish history, and of course – WW2, which this day did not monopolize the content. In total – more than 13 hours of time was dedicated to historical topics. What is worth mentioning here is the new in 2018 documentary series “Biało-czerwoni historie niezwykłe”, Unusual stories of the Polish national team. The series describes achievements of Polish sportsmen and sportswomen on the historical background. In this episode a sport star Halina Konopacka, the first Polish Olympic champion in Amsterdam, 1928 was presented. In the programming of the week it will be also another episode (on javelin thrower Maria Kwaśniewska-Maleszewska). The episodes will be repeated also in TVP Sport and TVP Polonia. History of sport is rarely main topic of programming in TVP Historia, it’s not clear if it is a new trend in understanding history. In the programming the main accent is on the military and political history, however, some positions referring to the history of culture are also visible. Biało-czerwoni historie niezwykłe, Unusual stories of the Polish national team, Pl 2018. Two position during this day were devoted to the Second Republic, one was debate „Spór o historię” (Disagreement about history) concerning the cultural and social character of the independent Poland during interwar period. Another one was the movie “Śmierć prezydenta” (The death of President), on the last days of the first, newly elected president Gabriel Narutowicz, assassinated shortly after his swearing in (1922). It is not strange in the context of the future celebration – in November 2018 Poland will celebrate the 100 anniversary of independence, recovered after WW1. Figure 7. „Spór o historię” (Disagreement about history) print screen – “talking heads” an the big screen with archival materials in the background as formula. In all the news in public and commercial television the celebration of the 30th International March of the Living (“Marsz Żywych”) was transmitted. During this year celebration among Holocaust survivors, young people from Israel, common people from Poland and all of the world were presidents of Poland, Andrzej Duda and Israel, Reuven Rivlin. The International March of the Living is educational practice for Israeli students and pupils, to remind them about the victims and enrich their knowledge about Holocaust. The media debate on this topic was very vivid this year, due to the previous conflict based on the new law introduced in Poland. In fact, this law referring to IPN (Institute of National Remembrance) was intended to protect the memory of Holocaust, not to block searching the truth about it, as it was presented in some foreign media. Polish government tries so hard to stop anti-Polish propaganda, especially referring to the phrase “Polish concentration camps”. Some journalists and politicians (in the USA, in Italy etc.) write about Holocaust focusing on the location of Auschwitz and some other death camps on the Polish territory, forgetting that during WW2 this territory was occupied by Germans. Reports from the International March of the Living stressed the truth about camps, about the perpetrators. Interviews with survivors and the March participants were also broadcast. Some comments internet users suggest that Israeli visits in Auschwitz (which is obligatory for students) should start in Germany, not in Poland to avoid confusion and simple associations: death camps and Polish territory. Figure 8. 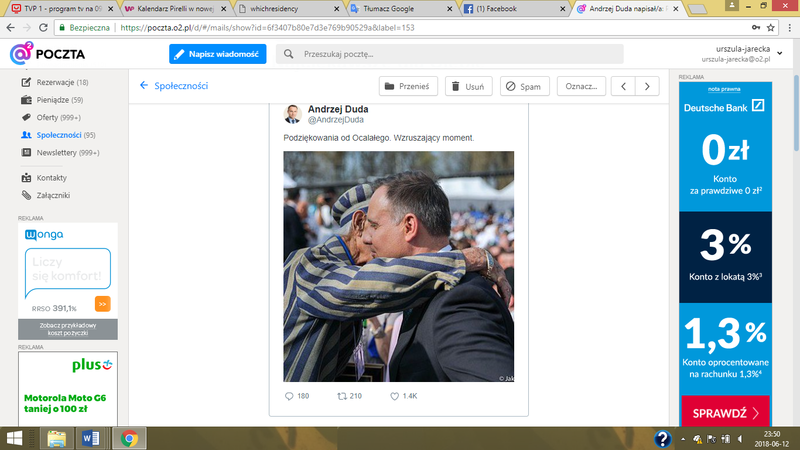 A tweet of Polish President, Andrzej Duda on this day. Official information about the International March of the Living was prepared by Ministry of National Education. Some information materials, including video clips are still present in the net, despite the political profile of the medium, e.g. parts of news referring to the event on the site of public television TVP Info, and commercial channel TVN 24 as well (the print screen below). Figure 9. A print screen from the TVN news on the International March of the Living. Figure 10. 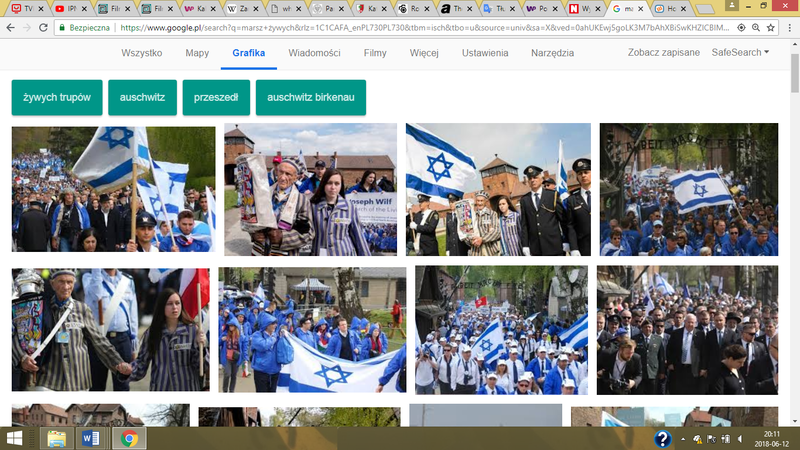 Pictures in the internet appeared on searching for “Marsz żywych 2018” (the International March of the Living). In the net opinions and discussions about the International March of the Living were connected to the next commemoration – the anniversary of the Warsaw Ghetto Uprising (April 19). On some fora people share photos and information, rarely comments. Sometimes in comments the internet users undertook hard topics such as the crimes committed by Poles and Jews on Jewish people during the WW2. One can also find opinions on the radical character of the Jewish Fight Union (Żydowski Związek Walki), responsible for the uprising in the Warsaw Ghetto. The picture above is from discussion on the topic put in one place wykop.pl, the poster is from the previous years celebrations. 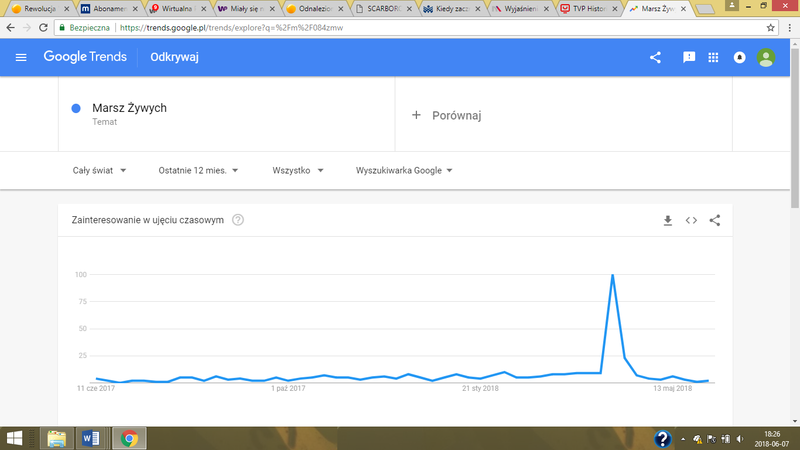 As it could be expected – the interest of the “Marsz żywych” in the searches in the Polish language internet is very strong close to that – with peak on April 12 (on the print screen below). Figure 12. A part of chart illustrating the dynamics of interest in the topic of “Marsz żywych”. Referring to analyzed television channels, in TVP1 only 3 positions in programming were dedicated to history – two episodes of “Korona królów” (The Crown of Kings, 61 and 62), and also one short documentary “Notacje” (Notations), episode 634 dedicated to the last Polish president on exile. So, only 1 hour was devoted to history here. TVP Historia broadcast circa 11 hours on historical programming. From the latter channel, from this and the next day schedule, I excluded TV series based on Greek mythology, “Powrót Odysa” (Odysseus), Fr-It-Portual 2013 (two episodes). In the total amount of time a lof of positions are devoted to WW2, some documentaries were on the Ancient and Medieval history (repetitions from April 11 schedule), and some on the newest history. 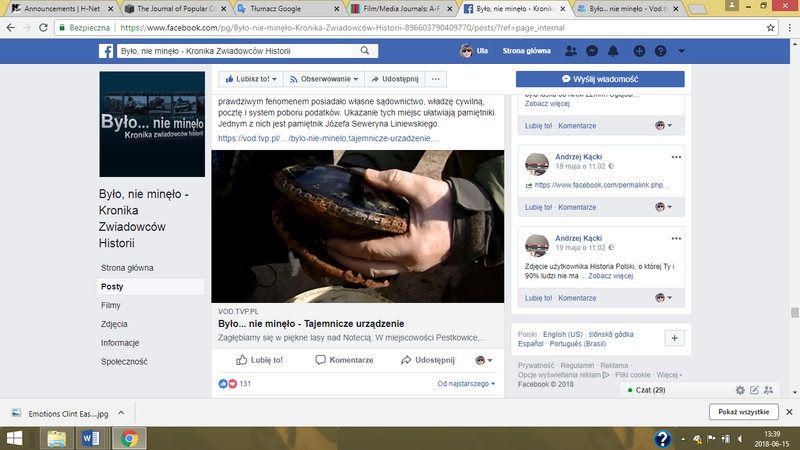 The reportage and documentary position “Kryptonim “Muzeum”- Szlak Armii Krajowej” (Code name “Museum” – Route of the Home Army) is produced since 2017 by public television in cooperation with Muzeum Armi Krajowej (The Home Army Museum) in Cracow. In TVP1 one episode of “Korona królów” (The Crown of Kings, 62) was broadcast, and in the night 10 minutes of Notacje / Notations, was presented (episode 509), it means 35 minutes dedicated to history in the schedule. This episode “Drzewa wyrastały z ich krwi” [Trees were rooted in their blood] was referring to Katyń. Only one position was also present in the official schedule of TVP Historia: documentary of 2014, “Poświęcając życie prawdzie” (Dedicating all life to truth). However, topic of Katyń was present in the news and debates which is not visible in the official schedule of any channel. It is hard to calculate the amount of time dedicated to these events. A lot of information, movies and discussions can be found in the net. Tracing the topic one can find not only fresh articles written by professional journalists but also the older ones, just like in the case of movie clips and documentaries on YouTube. All these materials belong to the new stage in social memory on the victims killed by Soviets in 1941. Figure 13. 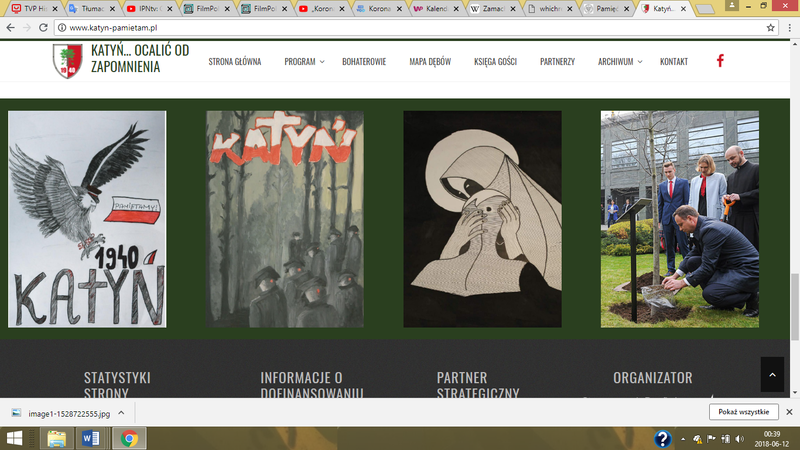 A print screen of the internet portal dedicated to Katyń and memory of victims (http://www.katyn-pamietam.pl/). Memory of the Katyń massacre belongs to this type of historical awareness, as for long years, from the very moment of its disclosure in 1943, it was either spurned, belittled, derided, or passed over in silence. Traumatic events that meet with silence spawn anxiety, aggravated pain, and emotional resistance in those who remember them. What forms is an awareness of one’s impropriety – namely, that one is tending to events which are unwanted, and which the rest of society is only too willing to sweep under the rug. Sometimes, for reason of politics, the information in society’s reservoirs of collective memory remains fragmented. The memory of some events can be incomplete, often because of a lack of sufficient information, as when important documents have been classified, archives destroyed, and so on. In such cases memory is uninformed, undeveloped. However, when mention of events is banned memory becomes disfigured. I employed the term ‘wounded memory’ describing all the circumstances connected with Katyń massacre in the article Wounded Memory. Rhetorical Strategy Used in Public Discourse on the Katyń Massacre. The name “Katyń” in the media debate often is used as general term for the massacre committed by the Soviets on the territory nearby the boarder with Belarus, in the locations such as Katyń itself, Miednoje, Starobielsk, Kozielsk. Figure 14. A print screen of the YouTube presentation of the documentary of Katyń massacre (the documentary of IPNTV channel). One of the worst open wounds in Polish collective memory is of course the Katyń massacre, whose absence in official, academic, popular, and media discourse has its roots in the silence surrounding the Soviet invasion of September 17. Throughout the years of the People’s Republic of Poland (hereafter referred to using its Polish acronym – PRL) it was forbidden to speak openly of either matter. Thus, within societal awareness a “whispered” truth arose, one that was often repeated in private conversations, and also propagated in the illegal press, that is, the materials produced by the opposition abroad, and which could not always pass through the Iron Curtain to Poland. It was from that body of material that one of the more important works on Katyń hailed: Katyń – zbrodnia bez sądu i kary [Katyń – a crime without trial and punishment], written by Józef Mackiewicz, who witnessed the first exhumation of the officers in the Katyń Forest in 1943. His book has been officially present in Poland since the 1997. In the case of the Katyń massacre, as early as the 1940s the truth had become a “prisoner of war” held by the victorious Soviets – a prisoner of the very regime that had committed the atrocity. For long decades the Polish side – especially Polish émigrés who opposed the system imposed upon Poland by the USSR – endeavored to disclose the facts concerning the disappearance of Polish soldiers in 1940. So, in Poland before transformation of 1989, the memory of the Katyń massacre nor did it meet with artistic portrayal of the kind that strengthens not only popular imagination, but historical awareness as well. Indeed, Polish culture has no universally recognized, accessible, and solid literary or film narrative on the topic. Rather, the Soviet invasion appears as a side motif in literature and film productions. In the 1990s and later on, book publications and documentary films that try to grasp September 1939 as a whole have been appearing on the official Polish market for several years now, and usually they evince an incomplete and dummied-down scope. One relevant example is that of the slim third volume of the series II Wojna Światowa: Kolekcja [WWII: the collection], entitled Atak Sowietów na Polskę [The Soviet attack on Poland], which devotes more space to the armaments of the Soviet formations than to the invasion itself. The book also includes information about the Katyń massacre, which was a consequence of the invasion. However, the film that accompanies the book fails to address Katyń at all. Referring to the other topics present in media this day – the table below shows types of programming and topics. 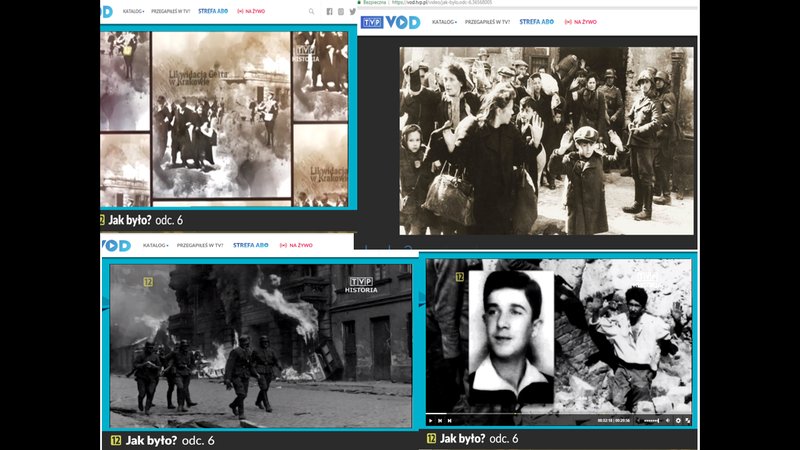 WW2 and the newest history are the most popular topics in TVP Historia. TVP1 channel broadcast circa 2 hours of content referring to history, titles and short description is in the table. One more programming is worth mentioning, excluded from the In the culinary program Okrasa łamie przepisy (Okrasa breaks the rules/recipes, episode 179), there are some parts devoted to history. In this episode the host, Karol Okrasa, takes viewers to the industrial revolution period. The episode entitled Hutnicza rewolucja w polskiej kuchni (A steel revolution in Polish cuisine) was filmed in the Muzeum Hutnictwa i Przemysłu Maszynowego [Museum of Metallurgy and Machinery Industry] in Chlewiska, and in the nearby area. Some information about history of technology on the Polish territory, but the main topic is cuisine and cooking in the Polish style. What is interesting, the anniversary of the Polish baptism went almost unnoticed, not only in the monitoring channels but in the other public and commercial channels either. Only in the information position Był taki dzień/ It was such a day…, a few sentences about it appeared. However, during this day, and April 15 as well, some episodes of short biographical documentaries, “Portrety niepodległości” (Portraits of independence) were broadcast in TVP Polonia. Events closer in time won the battle of media attention. Table 7. TVP1 programming referring to history, April 14, 2018. During Sunday, April 15 in TVP1 programming only 1 hour 35 minutes were dedicated to historical topics, representing by two feature TV series from distant epochs: 2 episodes of “Korona królów” (The Crown of Kings)  were broadcast (Medieval era) and one episode of “Wojenne dziewczyny” (War girls) was presented (WW2). Analysis of TVP Historia programming is available in the table no 9 below. The content here is mixture of topics and epochs. Two documentaries were on urban history, some on Ancient times, the other positions were dedicated to WW2, 19th century, etc. In this rather chaotic proposal new programming could be noticed – “Wielki test o Jasnej Górze”, A big quiz on Jasna Góra, dedicated to history of very important to the Polish religious history – the shrine on Jasna Góra in Częstochowa. The place was also important during the Polish-Swedish war in the 17th century. Wielki test o Jasnej Górze, A big quiz on Jasna Góra, .Pl 2017 Quiz dedicated to the history of the shrine on Jasna Góra in Częstochowa. In the television offer during the monitoring week in TVP 1 broadcast 12 hours 56 minutes scheduled historical content. However, it is hard to calculate how much time was dedicated to historical information based during the International March of the Living, and during the commemoration day of the Katyń massacre in the news and other programming such as studio discussion followed the news, etc. In public and commercial media historical content, and information about historical events and figures is mixed with political topics, or opinions based on political preferences of invited experts. This mixture can be confusing to viewers (and to the readers of the internet articles and information services). This trend is really strong this year. In the TVP Historia offer of the week April 9-15, 75 hours and 31 minutes of historical programming was broadcast. New programs appear in the schedule of TVP Historia: series of discussions support by documentary materials “Jak było?” How was it? ; “Goniec historyczny IPN”, [Historical runner IPN ], and the series of feuilletons on history of sport – “Biało-czerwoni historie niezwykłe”, Unusual stories of the Polish national team. Figure 15. A print screen of the first episode of “Goniec historyczny IPN” [Historical runner IPN] available on YouTube. Figure 16. A print screen of the studio debate in the programming “Jak było?” How was it?. Referring to the Web historical content – in this report there are some links to the television programming and the opinions of these positions, and some materials referring to the main historical topics connected with memorial days in Poland. As far as the internet is structured more by topics than by timeline of posts, articles, clips, etc., the analysis was rooted in the themes suggested by the importance of actual celebration. In social media, just like Facebook a lot of groups and pages are dedicated to history, some of them gathered quite impressive number of followers, e.g. “Historia jakiej nie znacie” (History you do not know) – 240 789; “Historia bez cenzury” (History without censorship) – 182 621. These Facebook sites offer “light” version of history, history is treated as entertainment. Figure 17-18. 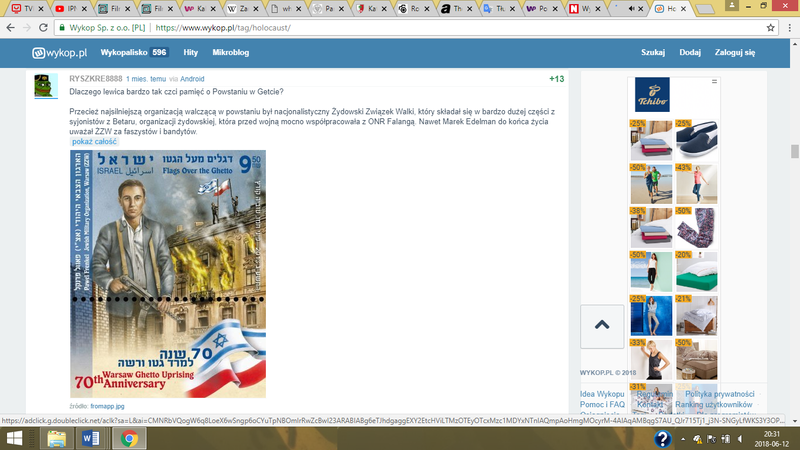 Print screens of portal niepodległa.pl with logo and topics. In the media content in 2018 Polishness, independence, and patriotic topics are popular due to the 100 anniversary of independence after years of Partition. They were also present in television programming in the mentioned week, e.g. “Spór o historę” with the topic of multiculturalism of the Second Republic, or memories of Ignacy Jan Paderewski, musician, politician, and independence activist appeared twice in the documentaries, together with some information about exhibition dedicated to his life and role in the beginning of the Second Republic in the National Museum in Warsaw (February 17 – May 20, 2018). Articles in the net referring to our national traditions, good name of Poland, important figures for polish history are located on the parts dedicated to history in different portals, and in the special services, just like the official public service: ttps://niepodlegla.gov.pl/. Events, information about historical context of independence, cultural, social and other aspects of everyday life during the Second Republic are promoted in the separate sections of the portal. Memory of victims is celebrated in Poland also during another remembrance day, June 14, Narodowy Dzień Pamięci Ofiar Nazistowskich Obozów Koncentracyjnych (National Day of Remembrance for the Victims of the Nazi Concentration Camps). For more information and context is good to visit: http://truthaboutcamps.eu/. This tragedy happened in the context of the Katyń massacre: Polish President, Lech Kaczyński plus 95 politicians and people from the families of the officers killed in Katyń travelled to commemorate the victims. However, they did not reach the location, their plane crashed close to the Smoleńsk airport. Some voices in this case in the world, in some European countries, and in Israeal tried to block the new Polish law, criticized that “the truth about Holocaust” will be penalized (https://dorzeczy.pl/kraj/54705/Spor-polsko-zydowski-nie-tylko-o-ustawe-dot-IPN-Ambasador-Izraela-potwierdza-Chodzi-takze-o-reprywatyzacje.html). The conflict was propagated in media in February and March, the accusation of antisemitism of Polish public media occurred (https://www.wirtualnemedia.pl/artykul/ambasada-izraela-zarzuca-tvp-info-antysemityzm-fake-news-laczacy-nowelizacje-ustawy-o-ipn-z-reprywatyzacja); some Polish journalists wrote about anti-polonizm in Israel, however, there were also opposite views (https://twojahistoria.pl/2018/02/12/w-izraelu-istnieje-potezne-polskie-lobby-ci-zydzi-to-goracy-polscy-patrioci-komentuje-profesor-historii-lukasz-t-sroka/). Journalists and politicians from other countries tried to react as well (e.g. Germany, USA https://wiadomosci.wp.pl/usa-naciskaja-zeby-izrael-poprawil-stosunki-z-polska-nie-chca-oslabiac-sojuszu-z-warszawa-6240493084547201a). Let me stress: on the occupied Polish territory during the WW2 Germans built some concentration camps which served as “death camps”. Authorship of the idea, plans and execution of them was German, not Polish. A lot of Poles died in Auschwitz and the other camps during the Holocaust as well. But in media even in Israel one can find information about “Polish Holocaust”, what is absurd and not rooted in historical facts (https://www.wirtualnemedia.pl/artykul/polski-holocaust-w-spocie-zydowskich-organizacji-do-wladz-usa-ws-nowelizacji-ustawy-o-ipn-marginalna-prowokacja-czy-skutek-katastrofalnej-dyplomacji-rzadu). It is not included in the table, because the main topic is never history. A series of press reviews and articles: http://www.newsweek.pl/kultura/filmy-i-seriale/korona-krolow-recenzja-telenoweli-tvp-widownia-korony-krolow,artykuly,421167,1.html. However, in the comments still visible on wp.pl with information about the decay of “Korona królów” (The Crown of Kings) popularity, and about statistics on viewers, the comments are very aggressive, negative, some of them could be treated as “hate speech” against TV series, and public television as such. 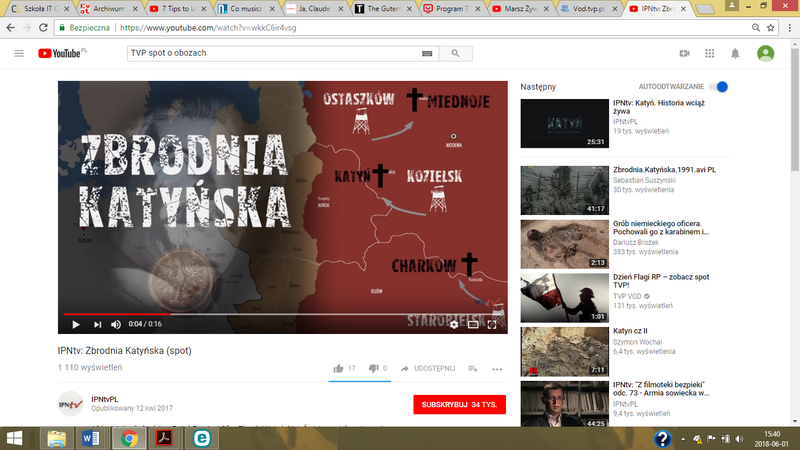 Some viewers tried to be more neutral, and also positive comments appeared: https://teleshow.wp.pl/ogladalnosc-korony-krolow-spada-22-mln-widzow-serialu-tvp-6244222747609217a. Polish title is first here just like in the television offer, however sometimes the program is not Polish, and it is mentioned in the table as well. The whole TV series can be watched free on the VoD platform: https://vod.tvp.pl/website/korona-krolow,34807622; this episode: https://vod.tvp.pl/video/korona-krolow,odc-59,36455332. IPN – Instytut Pamięci Narodowej, Institute of National Remembrance. Programming is dedicated to the methodology of historical research, and topics interesting for IPN. Some episodes are available in the net, together with the other programming on the IPNTV channel on YouTube: https://www.youtube.com/user/IPNtvPL. The channel gathered 35 110 subscribers. Stanisław Wcisło was a soldier responsible for guns for the battallion “Mrówka”. This episode is available on the VoD platform: https://vod.tvp.pl/video/tajemnica-twierdzy-szyfrow,odc-1113,36415036; the whole series: https://vod.tvp.pl/website/tajemnica-twierdzy-szyfrow,1667712/video. The mentioned episode one can watch here: https://vod.tvp.pl/video/spor-o-historie,ustroj-niepodleglej,37280839. Here are the links to services from the two ends of the political and ideological spectrum: https://www.polityka.pl/tygodnikpolityka/spoleczenstwo/1745308,1,marsz-zywych-przeszedl-po-raz-30-bylismy-i-my.read; http://www.radiomaryja.pl/informacje/polska-informacje/w-czwartek-prezydenci-polski-i-izraela-wezma-udzial-w-marszu-zywych/. Episode can be watched here: https://vod.tvp.pl/website/kryptonim-muzeum-szlak-amii-krajowej,34142820/video. “Flesz historii” is the TV series based on archival footage of the commemorations and the narrative about historical events. Produced – one weekly and then popularized. Just to explain the context: the town of Katyń lies in westernmost Russia. In and around Katyń in April and May of 1940 the Soviets murdered nearly 22,000 Polish officers and members of the Polish intelligentsia whom they had been holding as POWs. Each of the Poles was shot with a pistol in the back of the head, the bodies then being thrown into mass graves and buried. Urszula Jarecka, Wounded Memory. Rhetorical Strategy Used in Public Discourse on the Katyń Massacre, in: The Long Aftermath. Cultural Legacies of Europe at War, 1936-2016, eds. M. Braganca, P. Tame, Berghahn Books, New York – Oxford, 2018. – paperback, ISBN 978-1-78533-820-5; ebook ISBN 978-1-78238-154-9. Memory of the Second World War was strictly politicized in Poland: the problematic events such as the USSR’s attack of Poland in 1939, the Katyń massacre of 1940, and the Warsaw Uprising of 1944 never enjoyed a fitting media presence and were never the narrative forge for shaping society’s awareness that the German occupation was. The first episode of the series: https://www.youtube.com/watch?v=wlJ4zS-iB5s. In Polish there is a play on words here, “przepis” is the name for recipe and any rule, also law. The whole documentary is available here: https://www.cda.pl/video/126232488. The second part from this week programming starts at 33 minutes 28 seconds. The movie (without English subtitles) is here: https://www.youtube.com/watch?v=PY22fRFkKyo.